This report, focused on products of plant origin, shows examples of applications suitable for the building sector. The system NOVHISOL is a constructive frame of reinforced concrete and prefabricated multilayered walls of which one component is a plant fibers-based concrete replacing traditional masonry system (bricks, blocks). Feutralin is an 100% natural acoustic insulating underlay for laminate floors. Made of flax fibres, it offers a durable acoustic insulation and a good absorption of impact noises (ΔLw = 20dB). Technilaine is a hemp-based insulator composed of 85% hemp fiber hemp (grown and processed in France) and 15% polyester stable fiber. New synthetic insulating materials made ​​from bio-based chemical intermediates will be the products of tomorrow. EcoRenfort is a range of reinforcements for PVC joinery, made in a composite material based on natural fibers. EcoRenfort subsitues steel reinforcements and improves the thermal performance of PVC joinery while providing the necessary rigidity. Mammouth ® Neo is the first bituminous membrane based on thermoplastic polyurethane (TPU). These unique patented membranes are made of a revolutionary new material. It is an innovative and environmentally friendly rubber. It consists of bio-based raw materials, resulting in 75% of European rapeseed oil. Natura matt for walls and ceilings whithout dryers is a water based natural top coat paint made from 100% vegetal binder for walls and ceilings of "dry" rooms. StarFlax© Wall is a wallcovering based on non-woven linen, intended to be implemented in domestic and professional environments. This wallcovering is opacifying and its original aesthetic qualities allow easy use. ECO DECAP G is specially formulated for stripping substrates coated with paint, glue, or varnish. 100% biodegradable, it replaces strippers formulated with methylene chloride. FibriMat Mulch mat is our range of 100% biodegradable plant and tree mats made of natural fibres, for green spaces. It will help the growth of your plants ensuring a protection against weeds and a regulation of temperature and humidity for the roots. Wood-plastic composites (produced from materials such as compound REFINE® VH5793 composed of virgin PVC and 50% wood flour) are available today for decking. AQUAMEXOIL improves the finish of the concrete surface, is non-toxic and biodegradable. CecabaseRT® is a surfactant additive comprising at least 50% renewable raw materials which, blended with the bitumen, helps lower by some 40°C the application temperature of the road surfacing material without impairing its performance. 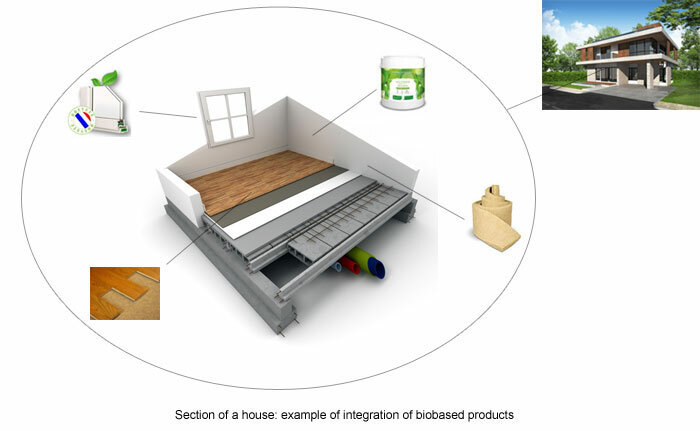 This label came into force in December 2012 to promote the integration of bio-based materials in new construction. The decree of December 19, 2012 (and corrigendum of December 23, 2012) specifies the conditions for awarding the label and includes three levels depending on the mass of bio-based material per square meter. Each level of the label requires a minimum of incorporation rate of bio-based material. It depends on the main use for which the building is intended (house, industry, storage, transportation service, other uses, etc.). This rate is expressed in kilograms per square meter of floor area.